Highlight of the RC44 season, the RC44 Cascais World Championship, gets underway tomorrow (30th September) on the familiar waters at the mouth of Lisbon's Tagus river. This regatta kicks off with a day of match racing, continuing the series that rolls between events through the season. In this, Vladimir Liubomirov's Bronenosec Sailing Team is stand-out performer, having finishing among the highest scorers at every event this season. They have 14 points, two clear of Torbjörn Törnqvist's Artemis Racing, in turn one ahead of Chris Bake's Team Aqua. Bronenosec also goes into Cascais as defending World Champion and winner of the last event in Marstrand. However Italian tactician Michele Ivaldi is not feeling bullish: "Everyone is at a very high level and there are at least six or seven boats that could end up winning this event. We will just go out and try to be first on the finish line." However Vladimir Prosikhin's Team Nika leads the 2015 RC44 Fleet Racing Championship, claiming the leader's 'golden wheels' in Marstrand. "To have the golden wheels for the first time is very nice, it gives me a very warm feeling…" revealed Prosikhin, with a grin. "You come to the boat, you touch the wheels…. They are SUCH a nice colour! But I'm not sure if I really deserve them." 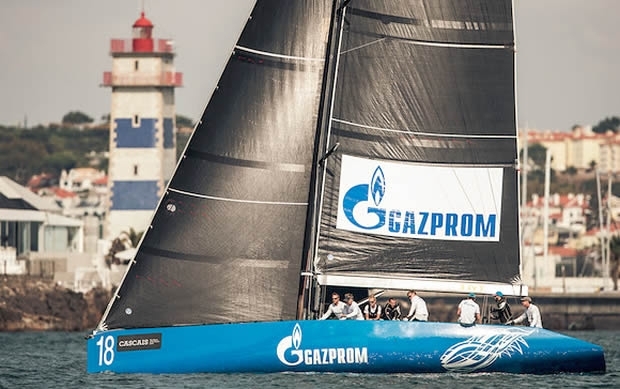 But Prosikhin is concerned he will lose them when a discard kicks in after this regatta (although the World Championship result can't be dropped). Unless Team Nika can win here, she is likely to lose first place, the fourth lead change this season. Prosikhin observes: "Competition is fierce and the first three are very close. So there is pressure. I have to relax, find my tune and not be too ambitious." For this regatta, America's Cup skipper Dean Barker is back on board as tactician. Also gunning for a World Championship win is Nico Poons and Charisma, being a previous holder of this title in the Swan 45. So which team is Poons most concerned about? "It is not a special team I'm focussed on beating - I'm focussed on winning! It is not football, but the ball is round and it can go anywhere and it can go anywhere with us. We will try to sail cleanly and see where it goes and do our best." Sailing with Charisma is Emirates Team New Zealand tactician Ray Davies, who is enjoying being back in the Portugese sailing mecca. "It is an amazing place to sail. You get the big waves from the Atlantic. You have the river going up to Lisbon, so there are a lot of interesting and difficult currents to manage." Sadly the forecast shows an absence of strong prevailing northwesterlies, instead indicating light winds for the next two days before a southerly builds later this week. The Charisma crew was awaiting mainsheet trimmer, Chris Hosking fresh from winning the Rolex Farr 40 World Championship. Davies continues: "It is good to get back on the water again. We recovered from an average regatta in Porto Cervo to a pretty solid regatta in Marstrand and we are looking to keep that momentum going." Although Team CEEREF missed Marstrand, Igor Lah's crew also has strong credentials having been crowned RC44 World Champion in 2013. "Cascais is a great place," says Lah. "You have a great 'wind machine', great waves, the city is brilliant, so why not come here? It is better than going anywhere else…"
As one of the longest serving RC44 skippers, Lah says he is enjoying the fierce competition within at the moment, with no one team dominating. "All the teams are at a really high level and are really well prepared - anything can happen." On board Artemis Racing new recruit, Francesco Bruni, will be calling tactics for Torbjörn Törnqvist for the first time. "I am looking forward to it - it will be interesting, a good opportunity for us to get to know each other," says Bruni. "I am very excited - it is a new challenge. The next two days will be important. We need to start working together as a team." Today the teams were officially welcomed to the RC44 Cascais World Championship by Carlos Carreiras, Mayor of Cascais and by Jose Matoso, Vice President of the Clube Naval de Cascais. "It is our honour to have all of you here," said the Mayor, representing the two major backers of the event - Cascais and Turismo de Portugal. "Cascais is a great place for yacht racing. Everybody now recognises the strong economic impact from sailing on both the local and general economy." Jose Matoso, Vice President of the Clube Naval de Cascais added: "On behalf of Clube Naval de Cascais - welcome. It is always a pleasure to have such a number of distinguished participants. The quality not only of the owner-drivers, but also the professionals is outstanding. It is excellent that you gave us the privilege of hosting your World Championship." Today's practice race was held in around 6 knots with Artemis Racing looking strongest (although not crossing the finish line).